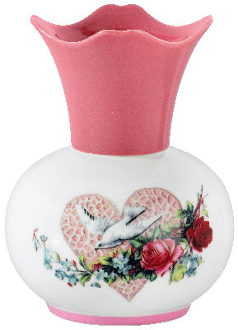 The Messenger of love lamp is the most truly romantic lamp that Lampe Berger has produced in many years. This lamp, with its pink ceramic shade, is pictured with a dove, heart and flowers one one side and a cherub with flowers on the other against a cream colored background. The lamp is supplied in a nice gift box with burner, funnel and instructions.